A police officer looks at a victim of the terror bombing in Bangkok Monday night. 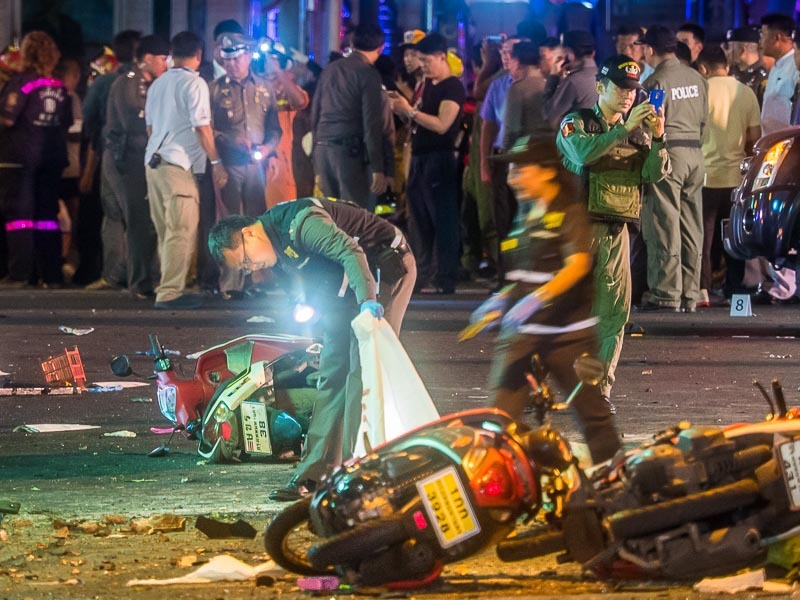 A bomb blast ripped through central Bangkok Monday night, shattering rush hour and causing death. Person or persons unknown left a package near a bench in Erawan Shrine, one of my favorite places in the City of Angels. 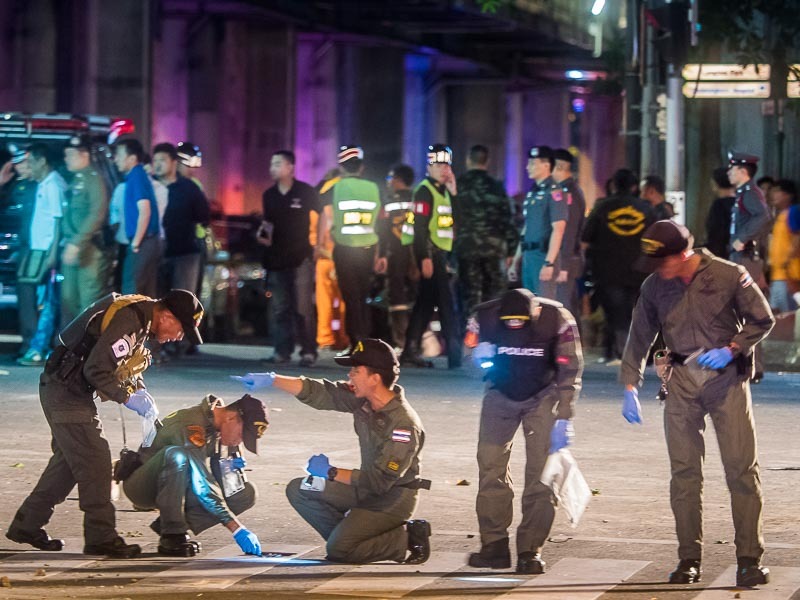 At about 6:55PM, the peak of rush hour, when the shrine was packed with tourists and devotees who had come to pray, the package was detonated. The resulting explosion sent a fireball into the night sky killed dozens of people and injured more than 100. Police look for evidence at the scene. I was home when the first alert about the explosion hit one of my social media accounts at about 7:10PM. I threw a set of lenses into a waist pack, grabbed my cameras and headed to the scene. Our apartment in Bangkok is about four miles from Erawan Shrine, which seems close but Bangkok is a very dense city with unbelievable traffic congestion. Four miles in Bangkok is far away. 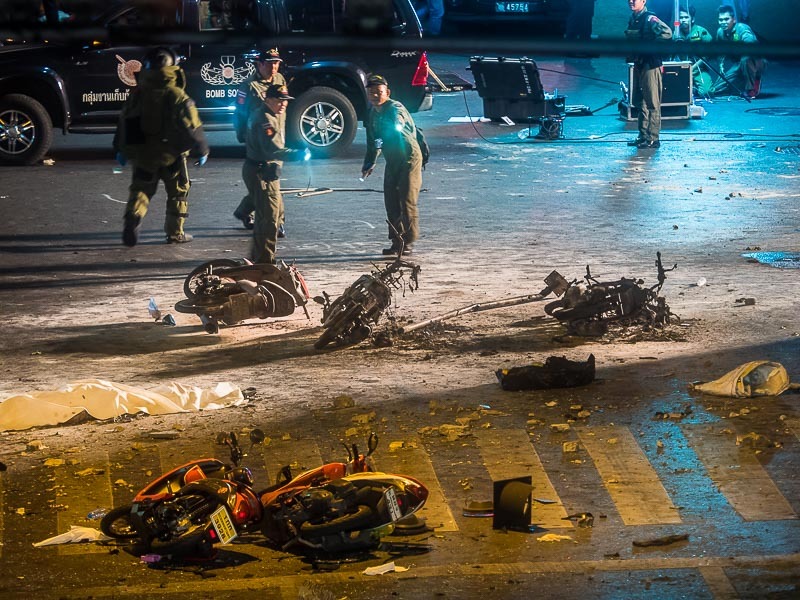 It was 8:00PM, a little over an hour after the blast, when I got to the scene. At that point, police had set up a perimeter about 100 meters from the blast site. Tourists were wandering around the neighborhood, behind the perimeter barricades and media was using long lenses to photograph the police, who were in the early stages of evidence collection and investigation. 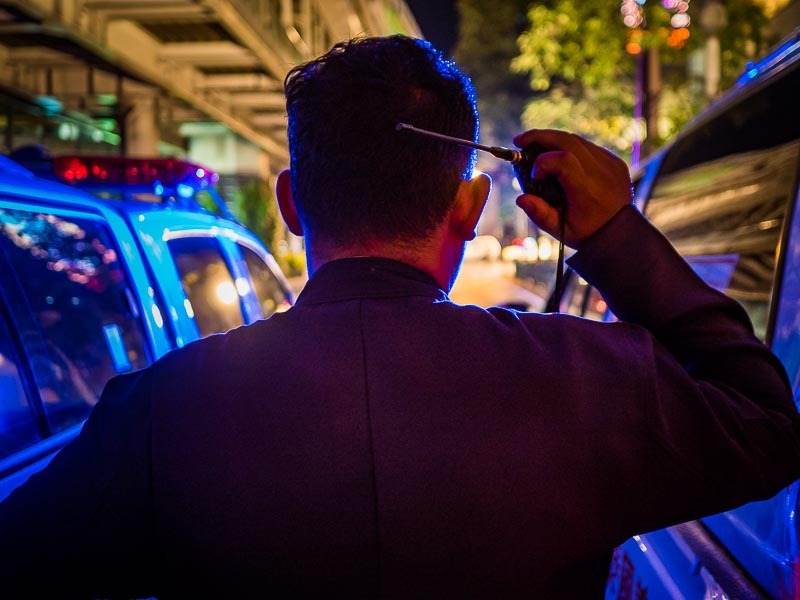 A police officer on crowd control duty watches his colleagues collect evidence. Erawan Shrine is located in the Ratchaprasong Intersection. It's the heart of modern, commercial, Bangkok. It's next to the Grand Hyatt Regency Hotel (which is also known as the Erawan Hotel), across the street from the Intercontinental Hotel, 100 meters from the Peninsula Plaza Hotel. Thousands of foreign tourists sleep within a stone's throw of the shrine every night. 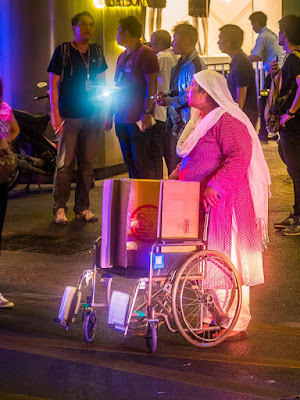 A tourist on the street after the explosion. Gaysorn, one of Bangkok's first high end malls, with a Leica boutique and Louis Vuitton store, is across the street from the shrine. Central World, one of Bangkok's largest malls, with Timberland, the Gap, Haagen Dazs, and hundreds of other chain stores, is kitty corner. The Police General Hospital is across the street and police headquarters are just 100 meters down the road, next to the hospital. It's hard to imagine a softer target in this city of 12 million people. It would be like putting a bomb on 5th Avenue or in Rockefeller Center in New York, on Hollywood Blvd in Los Angeles, on Avenue des Champs-Élysées in Paris or Oxford Street in London. 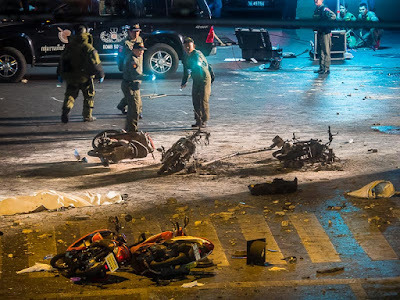 Destroyed motorcycles in the street after the explosion. What amazes me is not how bad the destruction was but how much worse it could have been. Aside from the initial fireball, there was no fire. Windows were blown out in the malls and hospital but there was no structural damage. And the death toll could have been so much worse. The shrine was packed with tourists and devotees, but Monday is street cleaning day in Bangkok. Normally, vendors selling flower garlands and religious paraphernalia line the sidewalk in front of the shrine, but not on Mondays. If the vendors had been there the death toll could easily have been double. There's been no claim of credit for the bombing and police don't have a suspect but the Thais will move heaven and earth and call in every IOU from foreign law enforcement to track down the perpetrators of this act. 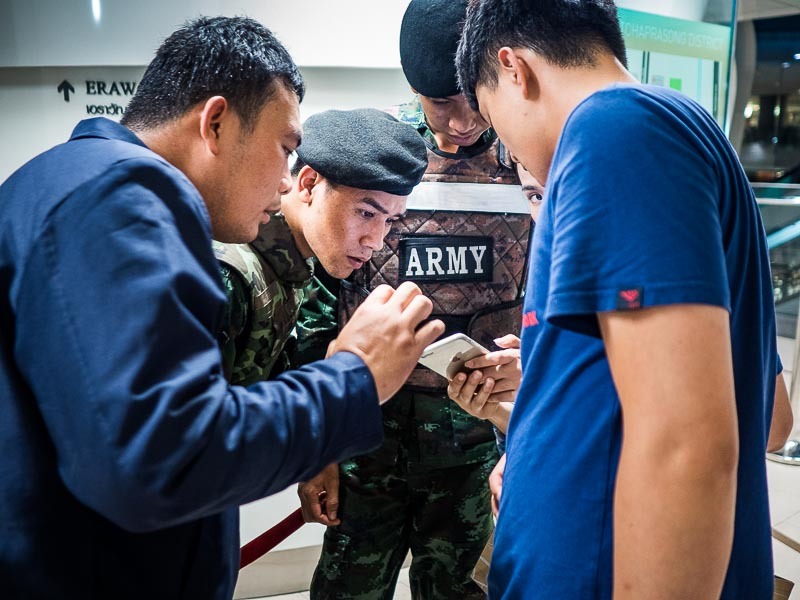 Thai soldiers help tourists lost after the explosion.